MARTIN LUTHER KING JR. DAY – 2016. On this January 18th, 2016 we once again join as a nation to look back on the message of Martin Luther King Jr. and are asked to reflect on “The Dream.” We have come a long way as a nation since the 1960?s. For those who say we have not, know nothing of the past and are lying through their teeth. I personally make it a point every MLK day to listen to the words of the slain Civil Rights leader and his “I Have a Dream” speech and reflect on what it means and where we are today with that dream. Make no mistake about it America, we are a much better country for Martin Luther King Jr’s dream. The United States of America has come a long way. Do not let anyone ever tell you we have not. But we still have a ways to go and may always have to. “The Dream” is much like being a Christian or life in general. You don’t just all of a sudden say, okay, I have reached my goal and nothing more is needed. People are not perfect, they never will be. We strive to be good and follow Christan values. That does not mean we do not fail or fall short. Have we come a long way, yes. However, does that mean we have much more to do and always will. The greatness of MLK Jr’s message is that it is for all people, not just one to blacks and another to whites. Martin Luther King Jr. had a dream, and it was one of inclusion that we “will not be judged by the color of our skin but by the content of our character”. Do not let any one else try and interpret that dream for you. Never let those with an agenda that is so far from “The Dream” to make you feel less or call you something that you are not. It is sad to witness today that those that are considered Civil Rights activists are more about race hustling and division, than they are about “The Dream”. Martin Luther King Jr. was correct, it is never about the color of one’s skin, it is always about the content of one’s character. Always! Do not ever forget, it is always about character. I have a dream that “The Dream” of Martin Luther King Jr. will be championed by real Civil Rights activists and not high-jacked by those for their own self-serving purposes and agenda and try to divide us as a country. To do so, to race-bait and to divide America whether you be a common American citizen, a pastor, a politician or a president does a disservice to Martin Luther King, Jr. and his “DREAM.” How I wish there was a true Martin Luther King Jr. alive today to champion the cause. Full text of MLK Jr’s “I Have a Dream” speech can be read here (pdf). The Bureau of land Management is pulling out, victory for Nevada cattle rancher Cliven Bundy. The Feds and the Bureau of Land Management (BLM) have blinked in their Gestapo tactics of governmental overreach in the confrontation with Nevada cattle rancher Clive Bundy. No matter what side of the argument you fall on with regards to this situation, one thing is for certain, this was a complete over-reaction on the part of the Obama administration in creating this type of hostile, overreach and volatile situation. After a week-long standoff between the Feds and the cattle rancher and his supporters, the BLM has done a 180 most likely because there has been too much media reporting of the Fed’s tyrannical nad police state actions. BLM Director Neil Kornze stated, “based on information about conditions on the ground, and in consultation with law enforcement, we have made a decision to conclude the cattle gather because of our serious concern about the safety of employees and members of the public.” More like, the memo came from on high, the Obama presidency cannot withstand a WACO. However, the Bureau of Land Management vowed Saturday that it would continue its legal fight to remove illegal cattle from a rural Nevada range. This is code for the Fed’s in Washington DC will pull every stunt, behind the scenes, to make this man’s life miserable and put him out of business as he dared make them look bad in public. 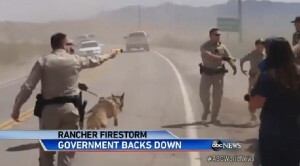 ABC News: Nevada Cattle Rancher Wins ‘Range War’ With Feds. Take a good look America at to how the Federal government is treating legal Americans. Attack dogs and tasering Americans, UNREAL. Remember when this used to be the United States of America, not a tyrannical police state? The Obama government does not do this to illegal aliens who come into America illegally, but they had no problem treating legal Americans this way. UPDATE I: BLM return cattle back to Bundy’s. Iin the end, this was all for nothing. A deal has been reached between Bundy family leaders and the Bureau of Land Management, but not without some very tense moments. Armed Bundy family leaders met with BLM officers Saturday afternoon in Mesquite to discuss the fate of the Bundy’s cattle that the feds removed from BLM land, over the past week. Under the deal the cattle were released from a holding area near Mesquite, back onto the federal lands they were removed from. However, according to the BLM, the deal does not absolve Bundy from any of the fees he owes for having the animals there in the first place. Rancher Cliven Bundy is not describing it as a deal, but as the American citizens taking back the cattle. “There is no deal here. The citizens of America and Clark County went and took their cattle. There was no negotiations. They took these cattle. They are in possession of these cattle and I expect them to come home soon,” Bundy said. On December 1, 1955, in Montgomery, Alabama, Rosa Parks refused to obey bus driver James F. Blake’s order that she give up her seat in the colored section to a white passenger, after the white section was filled and was arrested. 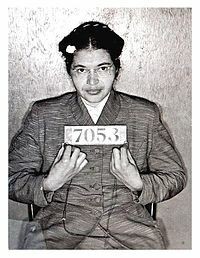 Her arrest for civil disobedience for ignoring the Alabama law requiring black people to relinquish seats to white people when the bus was full sparked a 381-day boycott of the Montgomery bus system. It also gave rise to the 1596 Supreme Court decision banning segregation on public transportation. Rosa Parks was a woman of great courage, charter, strength, perseverance and principles. On this day we remember her for standing up, or we should say sitting down, and saying no to what she knew was wrong. The story behind the bus. At the time, Parks was secretary of the Montgomery chapter of the NAACP. She had recently attended the Highlander Folk School, a Tennessee center for training activists for workers’ rights and racial equality. She acted as a private citizen “tired of giving in”. Although widely honored in later years, she also suffered for her act; she was fired from her job as a seamstress in a local department store. Today, President Barack Obama honored Rosa Parks on the 58th anniversary of her civil disobedience that would change America forever. Well kind of. It would appear that President Barack Obama decided to honor this day by honoring himself. What a shock that Obama would make it about him. Really, has this man no shame? 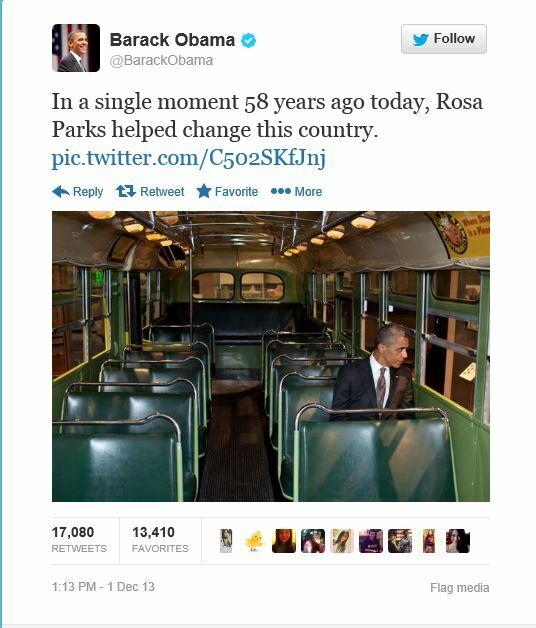 To remember and honor Rosa Parks on the the historic day what did Barack Obama do … why tweet a picture of himself of course. Just another head shaking moment from this president. What is this guy, a one trick pony? He used the same pic last year to agitate and compare himself to her as well. Way to go out of your way and do something different to honor an American hero. Some responses to Obama’s look at me, it is all about me remembrance. Oh, did I mention the world revolves around me, me, me, Barack Obama? The audacity of this man is repulsive. A note to Barack Obama, you would never know what it means to sacrifice like Rosa Parks and do something like she did that was so selfless and for others, not yourself. Hell, you can’t even sacrifice not golfing to do the right thing.